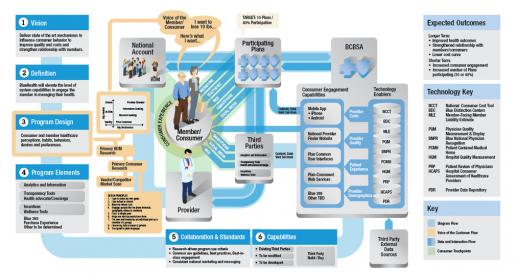 A large national healthcare provider contracted with Randal to produce an infographic diagram of one of their internal processes in delivering patient-centered national healthcare insurance, especially in light of the expected changes in the industry in 2014 as the Affordable Healthcare Act is implemented. 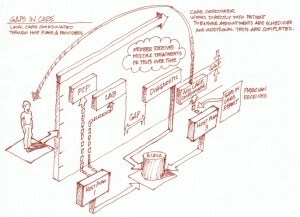 The customer will be using the diagram for internal company communications between departments and with vendors, as well as at the executive and board level. This final illustration was completed in Adobe Illustrator on an 11 x 17 artboard. The layers and transparency features were used extensively. It was delivered as a 1.1 MB master .AI file. 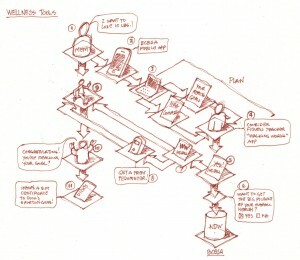 The process toward the final illustration started with hand drawn sketches of various business concepts and organizational ideas. 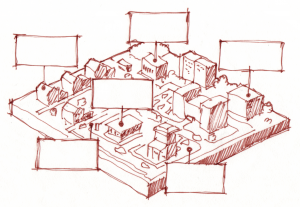 As feedback, resources and information were gathered from the client, the sketches became more detailed and solidified over time. At the point where a final direction was approved, the process was converted and continued in digital file formats.